As cyclists our hands take a punishment, and quality, fit for purpose, cycling gloves are essential for comfort, control and protection reasons. Hands, like all extremities, get cold easier than our core body, so in winter a pair of warm, weatherproof cycling gloves is an absolutely essential part of your riding kit. But gloves should be worn all year round. They increase your control by stabilising your handlebar control and increasing grip. Mountain bikers often choose a full finger glove with little or no padding to improve their trail feel and immediate response. 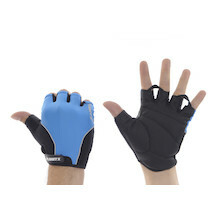 Others, looking for a day-long glove for commuting, road biking or touring, will require a well-padded cycling glove- often with gel pads in key areas. 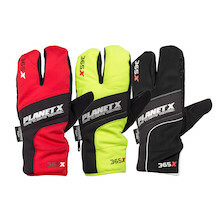 Our own ranges of On-One and Planet X gloves offers a level of price to performance unequalled elsewhere on the internet, but we also stock Carnac and 661 too. 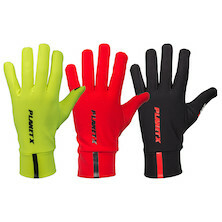 Our Fluo Yellow Fleece Liner Gloves are ideal for the in-between seasons: windproof, flexible and comfortable. 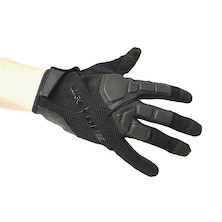 The attractively priced Fleece Liner gloves are made of WNDPRF-X159 fabric that keeps wind out and that repels water. These are the perfect gloves for those colder days when it's less pleasant to ride with classic, short-fingered cycling gloves. The black Trail Gel MTB Gloves are meant for those who want both the best possible steering control and still want shock-absorbing capacity. The perfect grip and control come from the Pittards leather palms; the full gel padding ensures efficient shock absorption. By omitting the padding, the black MTB Trail Gloves provide extremely direct contact with the handlebars and, with this, perfect control. The suede palm is nice and rough so you always have a good grip. Brakes and gear shifts can be operated properly thanks to the silicone print at the tops of the pointer and middle fingers. Mesh backed full finger MTB gloves with gel padded palm and knuckle protection. Perfect for MTB and Gravel bike epics. Carnac's Gripper Gloves use a wool-acrylic-elastane-nylon blend to provide incredible warmth, resistance to wind chill and the snuggest fit you'll ever find. 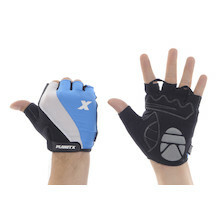 With Silicon Gripper prints on the palms and fingers and touchscreen compatible fingertips they're the perfect gloves for almost any activity. A great lightweight pair of gloves ideal for the summer months. A cycling mitt with all the features you need to ensure your hands are protected throughout the summer months. 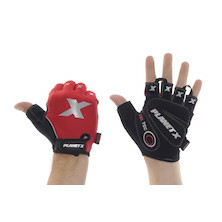 Grab a pair of these summer cycling mitts for a more comfortable bike ride.